The subject of glue is vast and I wish that someone had written this article a few years ago when I was struggling with which one to use for which job. With new products coming along all the time, however, this article can only be a definitive guide to current glues and their applications. I have included a quick-reference chart for the workshop wall but first here are six words of warning: no one glue will do everything. And when you start on a glue-up, fix to the workshop door another 10: "Unless the building is on fire do not disturb me." Get all clamps and clean-up equipment ready before you start. Choose your music carefully. Barber's Adagio for Strings is ideal as it is just the same length as the open time for Titebond Original - if you come to the end of the track and are not cleaning up it is permissable to panic at this stage. On the cover of The Hitch-Hikers Guide to the Galaxy are the words 'do not panic' - clearly they have never had to glue anything. This is the woodworker's glue, easily recognised by its white colour and now available in waterproof versions. We all use it. It has some major advantages and an equal number of disadvantages. It is cheap, easy to use with no mixing, cleans up with water, is ideal for rub joints and great for biscuit joints due to its high water content swelling the biscuits. It has a slight rubbery consistency when dry so is ideal for chair joints that are constantly under racking stress. However, if it is not cleaned off thoroughly it will affect the finish especially colour stains. The slight rubbery consistency means it is unsuitable for veneering because veneer joints open when the veneer shrinks; the high water content means the veneer will shrink as it dries. It can also bleed through veneer, leaving the same problem as not cleaning it off properly. 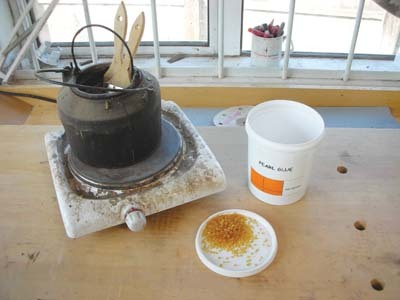 While this oldest glue known to man is still used - and I have a pot ready - its uses are nearly all replicated these days by better products. Antique restorers like it because it is reversible through heat and moisture, with gap-filling properties that are ideal for damaged and sloppy tenons. It has a very high initial tack and is better for rub joints than PVA. It was always used for veneering in the past but with the introduction of veneering presses, vacuum presses and better glues it is rarely used other than for small repairs. It is very messy, smelly and slow to prepare. It introduces too much moisture into the workpiece, so the veneer is subject to shrinkage unless it is taped perfectly. Its colour will stain the end-grain joints in veneer, resulting in a dark line on pale timbers. The workshop needs to be warm to get any sort of reasonable results and the components benefit from being warmed either with an iron or hair dryer. Once mixed it will last in the pot for seven days. Ureas have been around since the 1920s and were used in the early production of plywood with Cascamite being the most widely known. 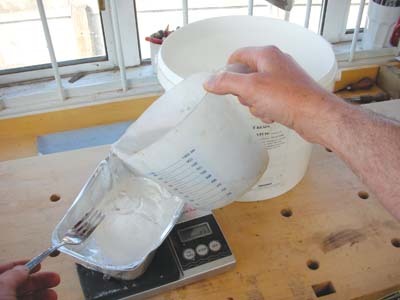 It is a two-part glue with water being mixed with the white powder to give a long open time. It is very strong and its uses include veneering and laminating. Many people continue to use it but there are better UFs on the market. Because it has to be mixed with water there are two downsides: the large water content in the glue expands veneer, causing shrinkage, and laminating also suffers more from springback when it is released from the mould. Mixing is a bit of an art because the ratio of glue to water is exact and glue failure is a real risk if quantities are wrong. Mixing is difficult because the water does not mix easily with the powder. Clean-up is with boiling water, which is also no fun. The new UFs do not mix with water. Most of them are a liquid and powder 2-part glue, and recently a 2-part liquid glue has become available. This is easier to mix, stronger, and does not expand veneer due to added moisture. Clean-up is with warm water. The best thing about the new UFs is the additives which hinder bleed-through when veneering. You can also match the speed of the hardener to your application. One of the other additives is colour pigments. By mixing small quantities of pigment powders you can almost perfectly match the glue colour to your wood choice. This is great for losing laminating lines. Poor shelf life and, until recently, large minimum quantities, make this not a great choice for the small user - only three monthsâ€™ shelf life on the liquid version although this can be extended to six if refrigerated. At my request this will soon be available from Redwood Innovations in a 1kg bottle. Borrowed from the boat-building industry, this adhesive is well worth the expense. It is incredibly strong, waterproof, chemical resistant, sets hard, has no creep and does not blunt cutting edges as badly as UFs. 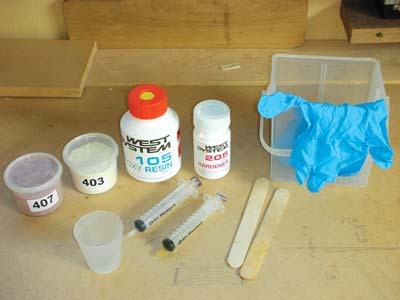 The most common version of this glue is by West System. This companiy supplies a large range of additives including fillers and fast and slow hardeners. The trick with all epoxies is mixing ratio; put too much hardener in and the stuff will not set. You cannot increase or decrease curing time by the amount of hardener - I have tried with disastrous results. I will always measure out the quantities using a set of digital scales. The pump dispenser system that West System supplies is good but not idiot proof - you have to ensure both pumps are primed and pushed down equally otherwise the ratio will be incorrect and you will be left with a sticky mess that will never go hard. 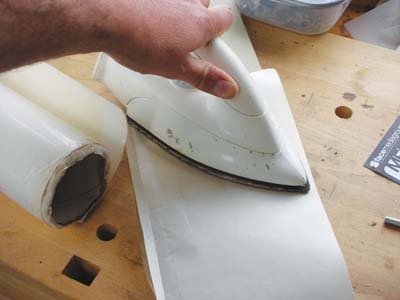 The best applications for this type of glue are laminating and some joints. It is particularly good for laminating as the piece has almost no springback after it has set. If a curve has to be accurate this is the best glue on the market. It can be tinted using water stain powders and the appropriate filler. Many makers use it on veneering, but I think it is too expensive for this type of work, very messy and hard to clean up. With the right filler it is an ideal choice for repairing sloppy or broken tenons or for gluing a length of steel studding in the place of a tenon on contemporary work, although some would say this is sacrilege. A couple of tips to help when using epoxy glue: hold the glue in a shallow metal tray to stop it from curing too quickly; place excess mixture in the freezer and defrost as required. Recognisable by its smell, this glue is very high in solvent, can be intoxicating in confined spaces and has little use in my workshop. The principal in most applications is to apply a layer of glue on both surfaces, wait for around 10 minutes until the glue is touch dry, then place together and apply pressure. Usually this type of glue does not need clamping and just pressure pushing the two surfaces together is sufficient. It is available in liquid form in tins and in spray cans. 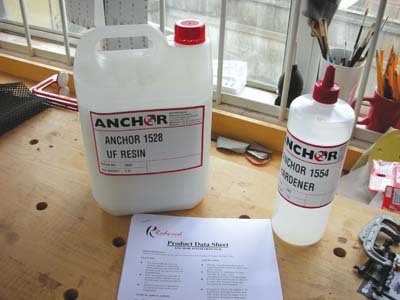 The spray version is now being used in contract fitting of yachts, shop fitting and exhibition stands. Its ease of application means plastic laminates and veneers can be fitted to complex shapes on site. I have tested this type of contact adhesive and while I can see the benefits I find it to be unsuitable for fine work for three main reasons: overspray, positioning of pieces and glue creep. It is also expensive and uneconomical due to the thick layer of coating on both surfaces. Its major drawback, however, is longevity, and it has to be said that most of the brands I have used have eventually failed. 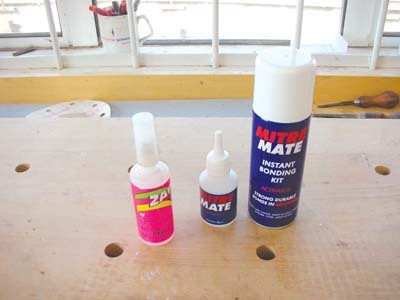 This glue has a strong following with woodturners for its ability to glue cracks and stop splitting and has gained popularity amongst furniture makers recently, myself included. They last longer and do not get clogged nozzles, and I have three types stashed in the fridge: Super thin (water-like consistency), Original and extra thick. 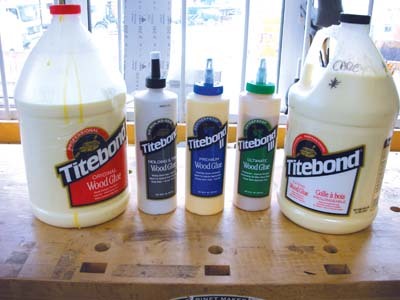 These glues have almost unlimited uses, most commonly in gluing back broken edges or lifting veneer. They are available with different curing times and these can be speeded up using an accelerator which will set it almost instantly. Sprayed with accelerator, the extra-thick version also has a good gap-filling property. Put a small amount of the accelerator into the hole before gluing and then spray with the accelerator to set the glue throughout. A slight loss of strength occurs the more glue is used and when using the accelerator. Downsides include its ability to glue skin, the fact that the accelerator, when mixed with the glue, turns white and can only be removed with sanding, and the high cost. These glues have a fast initial tack between one and 15 minutes, short clamp time and full cure within 24 hours, are waterproof, and strong. They react with moisture to activate curing so can be used in damp conditions and are ideal as exterior adhesives. This type of glue expands as a foam when it cures and therefore can push away the bonding surfaces if not clamped sufficiently. It has very little strength when used as a gap filler and will turn skin temporarily black. The stain can be removed when wet with acetone but this chemical can cause skin irritation. 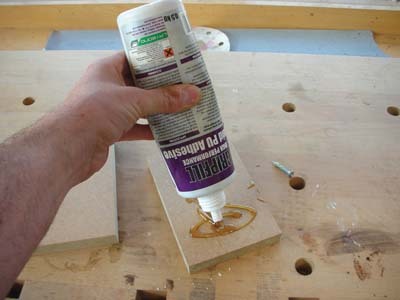 Two different applications of this style of glue are available. Electric or gas hot-glue guns which convert glue sticks into a hot, quick-setting glue can be bought in craft shops and general DIY stores, but the strength of the glue is poor and the quick-setting application hinders its use in furniture making. It is however ideal for model making. The second style is hot-setting glue film which comes in sheets of about a metre wide, available from most veneer suppliers. Very useful for small veneering jobs, it can be set with an iron and a hard roller, but the longevity of the cured glue is questionable. Care must be taken to ensure the glue has been heated adequately to ensure a good bond; also, a change in moisture content in the room can result in bubbles in the veneer. It is very easy to use and sets instantly.